Beckmann interviewing Johnny Wangler following the 2012 spring game. 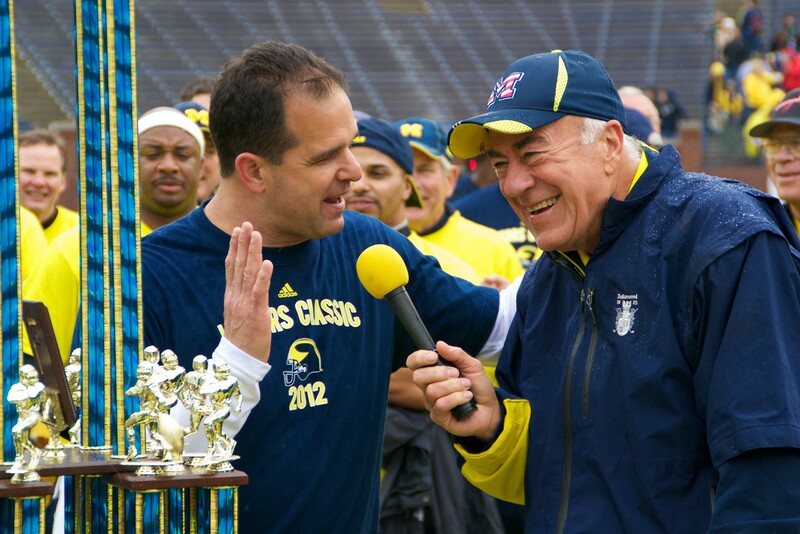 Longtime Michigan Football radio broadcaster Frank Beckmann has announced, via an IMG release per UM media relations, that he will retire from the Maize & Blue airwaves after the 2013 season. Ann Arbor, Mich. (August 9, 2013) -- Frank Beckmann, the legendary voice of University of Michigan Football and a member of the Michigan Sports Hall of Fame, has announced his retirement effective the conclusion of the 2013 football season. Beckmann began calling play-by-play for the Wolverines in 1981. He is only the second person to handle play-by-play duties for the flagship network broadcast of Michigan football in the past 65 years. After stints at WKNR-AM in Dearborn, WDRQ-FM and Channel 2, Beckmann joined the WJR news staff in 1972. As news reporter he specialized in the kind of hard-hitting reporting that won him numerous awards, including the National Headliner. He also received a citation for “Best Coverage of a Single News Event” ... the Hoffa Disappearance. Also announced earlier this week although we're just getting around to weighing in on it...For 33 going on 34 years, Bruce Madej has served the Michigan athletic department as sports information director as well as associate AD. His career speaks for itself, but on a personal level, he was instrumental in granting me the access to the program that I have. I will always remember him as the reason I began to cover Michigan Football in a peusdo-professional manner. ANN ARBOR, Mich. –Bruce Madej, the longest serving Sports Information Director in the history of the University of Michigan Athletic Department (1982-2010) and now U-M’s Associate Athletic Director for Special Projects, announced (Wednesday, August 7) his retirement effective June 30, 2014. Between Jon Falk, Frank Beckmann and Bruce Madej, that's an incredible 107 years of combined service to Michigan athletics that will be retiring within the next year. Truly the end of an era at Stadium and Main. My hat's off to these Michigan Men.